How great is it when the best clients come to you!? 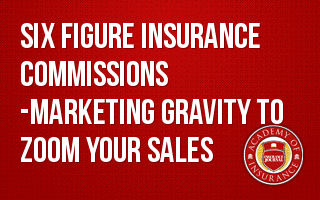 The right marketing plan can help you build your marketing gravity - clients come to you because of your perceived value. This fast paced, hour-long session will give you the tools and techniques of building an insurance sales pipeline that's filled by others. Join us in this practical program on improving your marketing - marketing yourself and marketing your agency. This is an interactive session with a chance for you to ask questions. It is the first of a two part series on generating a six-figure income (Part Two, Masterful Presentation Skills). How people search out expertise. How to become a person of interest in your market. How to simplify the process writing articles. Why positioning yourself as an expert is key today. How to get speaking engagements. How to get your articles published.